Product information "Kairo Black nubuck leather greased"
The permanent wear of slim-fitting fashion shoes can be painful for your feet and toes. 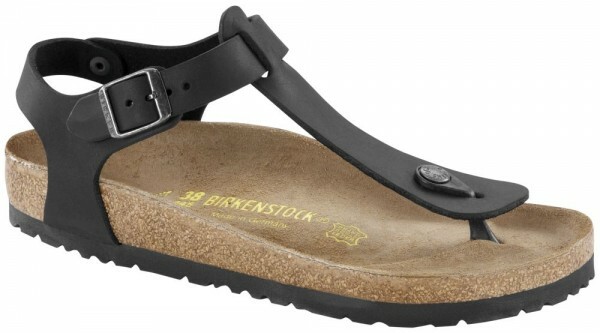 The thong model Kairo by BIRKENSTOCK® places the toes back into their natural position. For this reason, we recommend to choose regular as width. The popular BIRKENSTOCK® Kairo sandal with an anatomically formed cork-latex footbed and smooth suede lining melds design and comfort to great effect. The sandal boasts a heel/instep strap that can be individually adjusted using a metal buckle. The strap wraps around the ankle to provide the foot with additional grip. Related links to "Kairo Black nubuck leather greased"
Customer evaluation for "Kairo Black nubuck leather greased"